In our high-powered, charged-up lives, where do we most need to feel safe and secure? The airport, of course. But “hurry up and wait” airport protocols can lull us into carelessness with our most precious possession—our identity. 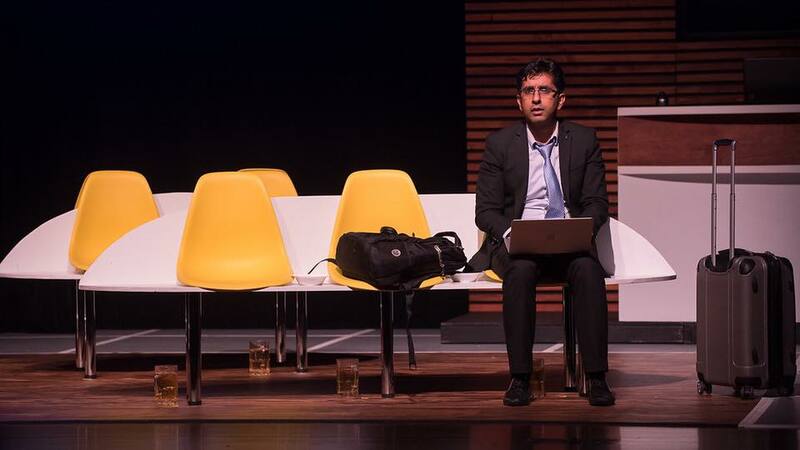 Naatak Theater’s new play “Airport Insecurity: A True Story” shows an Indian American marketing manager Vijay (a handsome Varun Dua) robbed of his possessions and stuck in a hopeless airport crisis. Vijay’s busy life crashes to a halt. We know his traveler’s nightmare is eventually going to resolve. But the possibility that this could happen to us fixes our attention on his ingenious maneuvers, as Vijay struggles to escape from a witty web of misdirection. 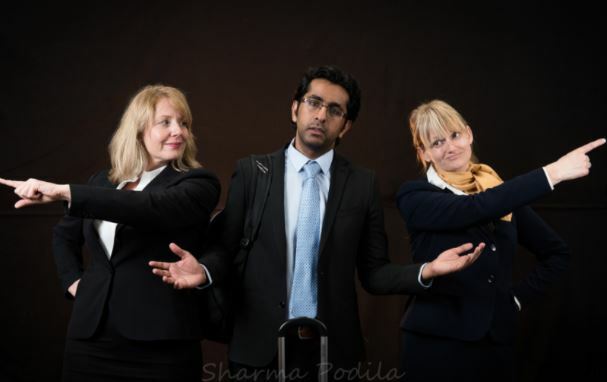 “Airport Insecurity,” written and directed by Vikas Dhurka, is based on real experience. Set in Frankfurt Airport, he uses a few set pieces and visuals to make us feel we are at the Lufthansa desk or MacDonald’s or an airport lounge. Two smartly-dressed flight attendants pass out programs, preparing us for takeoff. The Captain of Flight 56 welcomes us on board. 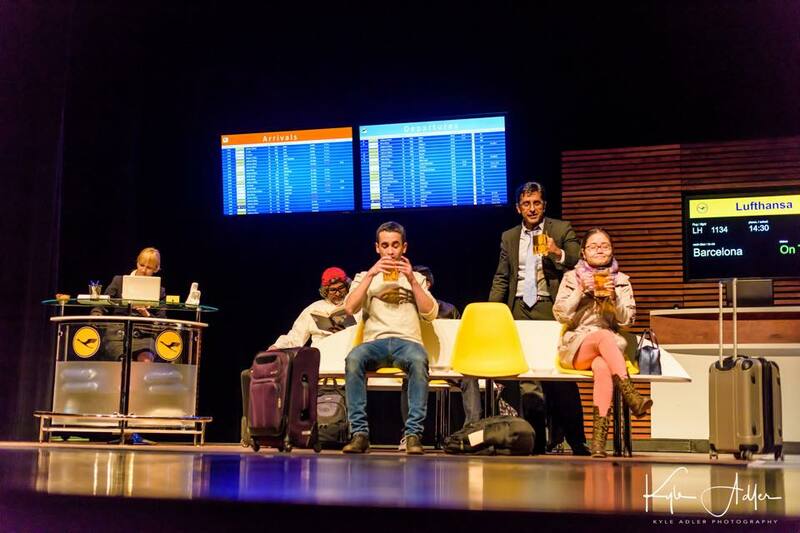 We are ready to fly in when the play opens in the boarding area: Vijay, handsome and confident, and his marketing team are traveling to a trade show in Barcelona. The hyper-confident man we first encounter is a success in his job, with his peers, and with his engaging wife back home, who is on the verge of delivering their first child. 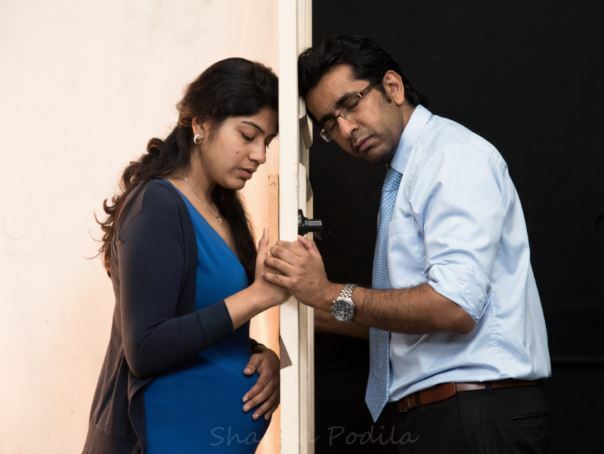 Vijay’s talks with his wife Priya (a warm Devika Ashok), about her pregnancy, seal our emotional bond to them both. All the phone conversations are live on stage, giving a vibrant quality to the staging. Vijay and Devik interact as a couple in sweet and humorous scenes. Then, disaster intervenes: Vijay loses his passport, phone, and wallet to airport thieves. And he forgot the charger to his laptop! Unable to board a flight without papers, he is abandoned in Frankfurt Airport to navigate for himself. Playwright Dhurka presents a parade of quirky characters to keep Vijay’s predictable setbacks interesting. He has no money, no food, no hygiene. No sleep, no phone, and no papers. Vijay’s spirits take a nose-dive. Even a funny conversation with his parents (Leena Sujan and Naresh Malik) cannot save him. The places to reach out for help are obvious—the consulate, his boss, his wife, the airlines—each executed with a fine directorial eye for characters. The Executive Vice President of Vijay’s company, “KK” (Ramesh Krishnan), is more concerned with his golf stroke than the plight of his marketing team. The bizarre Lufthansa Lounge Manager Angie (Rachael Hadassah) strikes provocative and confounding poses. A friendlier airline agent Michele (Julia Sachon) does her best to help him. But Maya, the Air India rep (Shreya Bhattacharji) ignores him and plays solitaire. 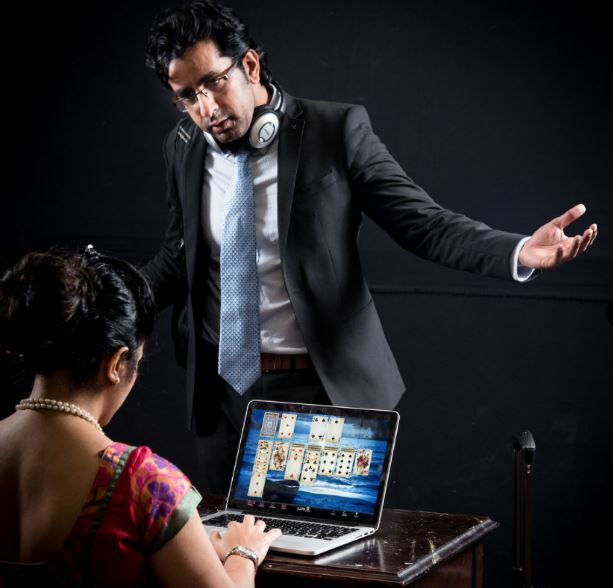 The bureaucratic and pompous Indian Vice Consul, (a convincing Ashish Chakrabortty), refuses to help Vijay on the weekend despite his desperate situation. The Indian bureaucracy is Guess What? —hilariously unhelpful: they suggest he apply for an Indian Passport in Pakistan! “Airport Insecurity” explores what happens to our well-ordered lives when we lose the basics. We are touched as Vijay’s confidence slowly erodes. Papers hold our identities hostage. And our homeland is not necessarily the place where our papers were issued, bringing fear to the hearts of immigrants who have built their lives and families on U.S. soil. The new, capricious Trumpery adds new fears every day. Vikas Dhurka’s play is profoundly international: small sections break out into other languages. The jokes that set the audience roaring burst out in several languages and accents: Hindi, Punjabi, Marathi, Bengali, and Gujarati. Cast: Varun Dua, Lior Abraham, Peihong Huang, Parag Kilche, Mukund Marathe, Valerie Quade, Devika Ashok, Julia Sachon, Kaushik Shirhatti, Shreya Bhattacharji, Ashish Chakrabortty, Ramesh Krishnan, Sathish Sattanathan, Paul Costello, Monica Mehta Chitkara, Rachael Hadassah, Leena Sujan, Naresh Malik, Prachi Albal, Nischay Tripathy, Ramya Sattanathan, Natraj Kumar, Natalie Vais, and Anitha Dixit. For more plays, check Theatrius: Now Playing. Also check our Recent Shows list, below.